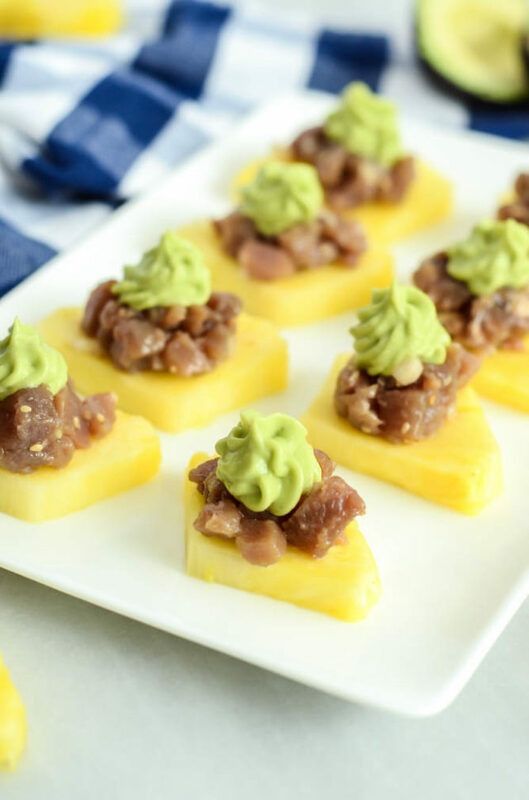 Tropical fruits are paired with a delicious selection of cheeses, honey and macadamia nuts – perfect for your next warm weather get-together! 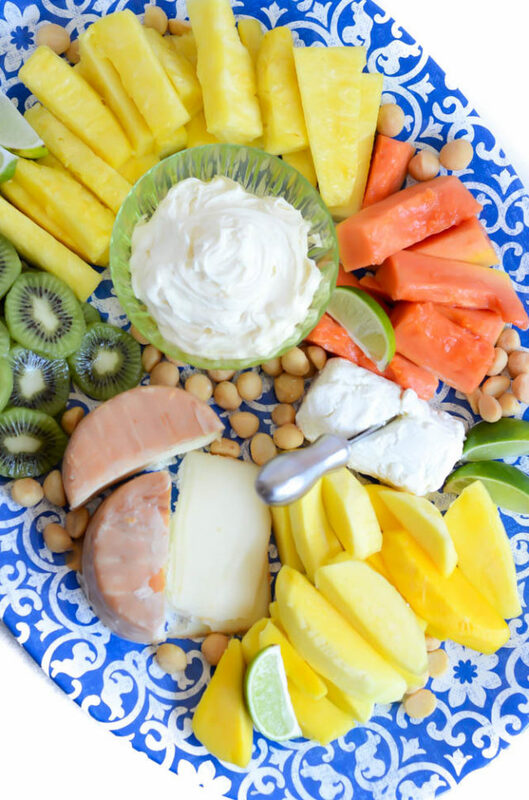 I’m calling it right now: Tropical Fruit and Cheese Platters may just become summer’s “it” entertaining item. Because, I mean, when it’s sunny and 75 degrees out, who doesn’t want a plate piled high with pineapple, papaya, kiwis and allllllll the cheese? 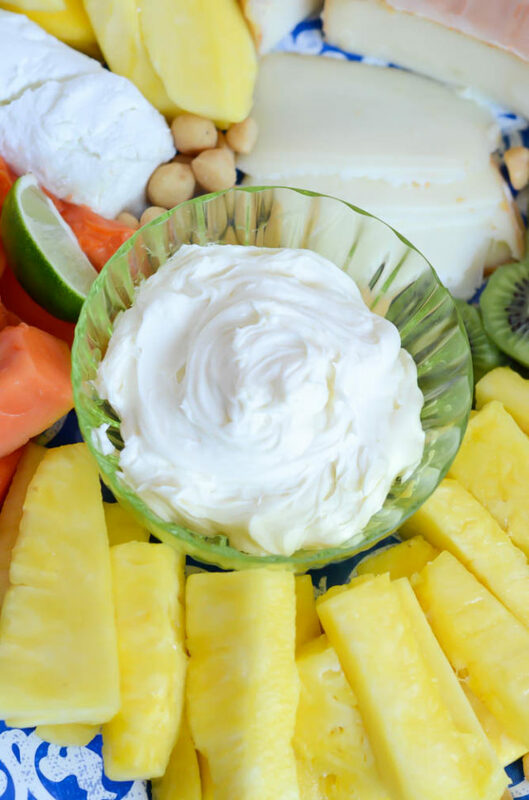 Now, I know what you may be thinking: “Ick, how does tropical fruit and CHEESE pair well together?” Well that, my friends, is all in the cheese. 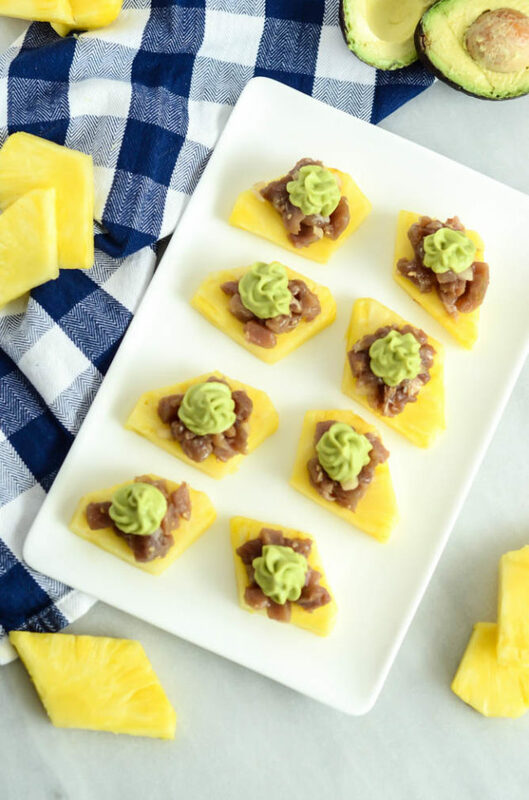 You see, I take my job as a food blogger very seriously and would never want to lead you astray, so I was sure to taste multiple cheese and tropical fruit combinations before I settled on the ones you see here. 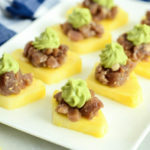 True, there are some pairings that just don’t work, but hey, there are a lot of pairings that do and I’ve taken all of the hassle of figuring that out off of your shoulders and come up with some fantastic pairings that will make your next Cinco de Mayo, Mother’s Day or Memorial Day get-together to the next level. 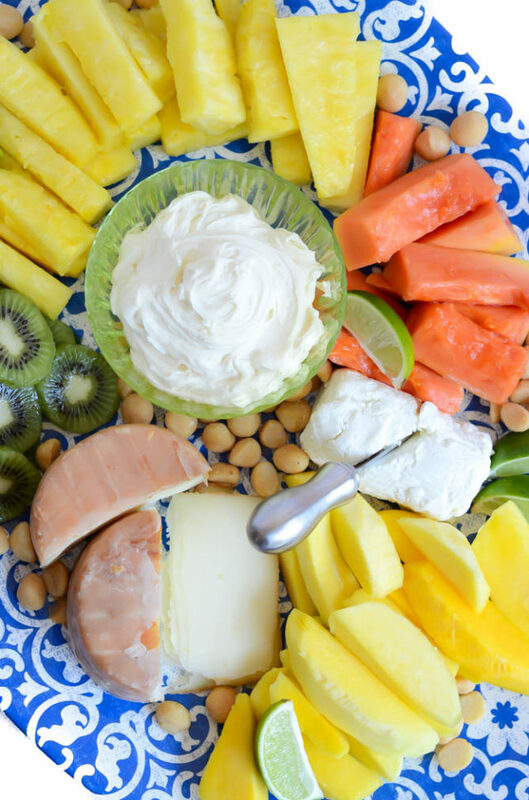 I actually came up with the idea for this Tropical Fruit and Cheese Platter last October, when my dad and I took a “business” trip to Oahu, which essentially entailed us eating our way through the island for a week. If you’re in tune with the Oahu restaurant scene at all, then you’ll be no stranger to local celebrity chef Ed Kenney’s restaurants that have been making waves (haha, pun intended) all through Honolulu over the past 10 years or so. We ate at three of his four restaurants while we were there (and only skipped the fourth one because we had eaten there multiple times when I lived there) and were duly impressed by each one. Be sure to check out my Travel Diaries: Honolulu post for more deets on all of those, but right now I want to tell you all about the basket cheese we had at one of these said restaurants, Mud Hen Water. We were able to talk my aunt and uncle into joining us for this dinner, which was all the better since everything is served family style and this way we could order double the amount of dishes to share. I was immediately intrigued by their menu offering of “Homemade Basket Cheese” so we decided to give it a shot. What was delivered to our table just moments later was a soft, ricotta-like cheese served with a multitude of fresh tropical fruits and, let me tell you, my mind was blown. Up until that point, I had only thought that grapes, apples, apricots and the like were acceptable to be served with cheese, but boy was I proven wrong. The creamy, mellowness of the basket cheese paired perfectly with the mango and papaya that were served alongside it, and it immediately got the food blogger wheels churning in my head about what other types of cheeses might pair well with what are some of my favorite genre of fruits. 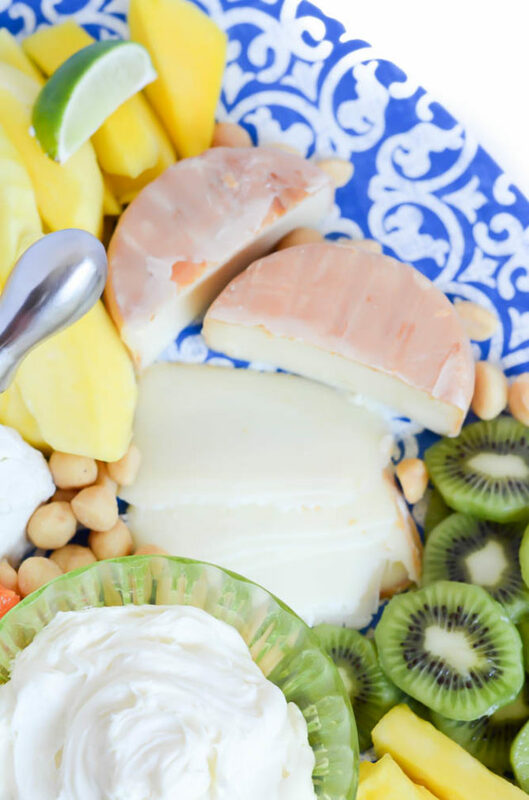 So here’s what I ended up discovering in my in-depth research of the perfect tropical fruit and cheese pairings: Any of the mild, soft ricotta-like cheeses are a DREAM pairing for allll the tropical fruits. Especially if you add a little honey! I took some creamy mascarpone I had sitting in the refrigerator and sweetened it up a little, and let me just say you’re lucky I saved some to photograph because I could have very easily sat there and eaten the whole bowl with my pineapple and papaya spears. 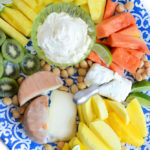 Sticking with the creamy theme, I also found that a good, simple goat cheese is a great pairing for most tropical fruits. 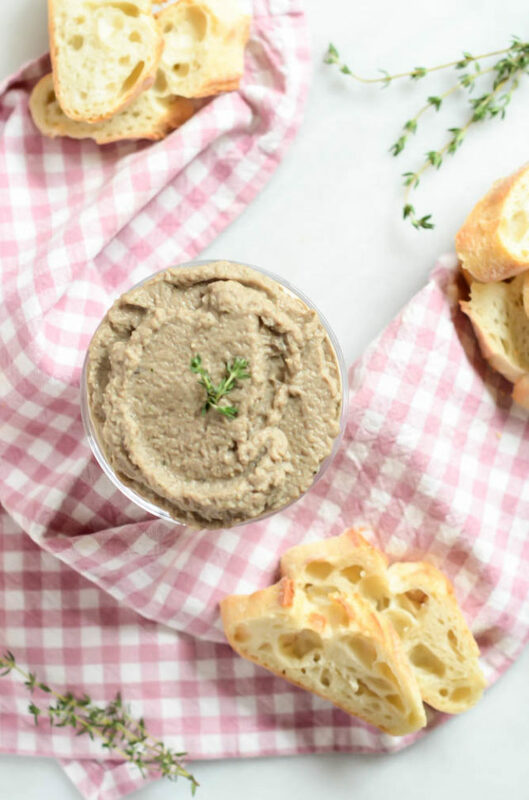 It adds a simple tang (much like unsweetened or Greek yogurt would) without overwhelming the fruit with too much funk or contrasting flavors. The only hard cheese that made the cut in my taste test was a basque cheese I picked up from Trader Joe’s. It has just a touch of funk, but not so much that it fights with the other flavors on the platter. It’s fairly mild compared to some other hard cheeses, and the slight saltiness is a great contrast to the sweetness of the fruit. Papaya is an interesting fruit, and can be fairly one-dimensional and almost a bit musty tasting at times. 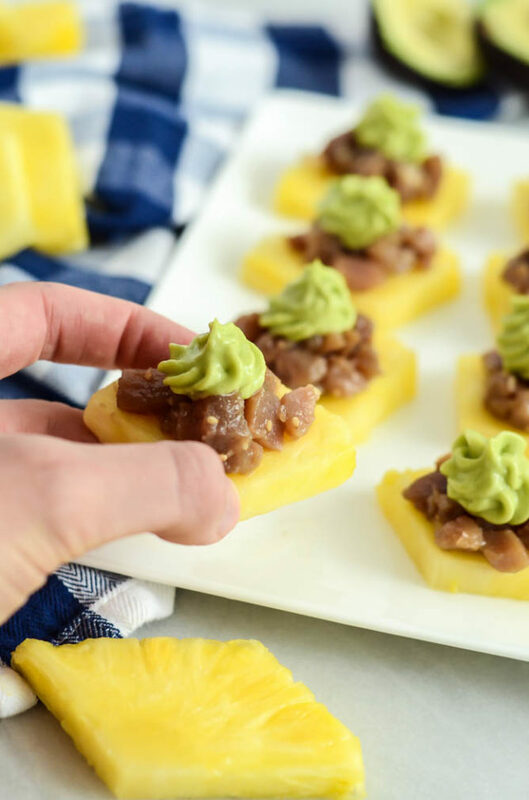 I find that a squeeze of fresh lime juice over top really transforms the flavor palate so be sure to serve some lime wedges on your platter for people to add as needed. Of course another typical component you see on most traditional fruit and cheese platters is some sort of nut. This adds a crunchy and often salty element to the mix to contrast all of the sweet- and savory-ness. In sticking with the tropical theme, I added some macadamia nuts to the platter which added the perfect finishing touch. And that’s it, folks! Really, the only “cooking” involved in this super easy party dish is stirring some honey into the mascarpone and plopping it into a bowl. Easy as that! 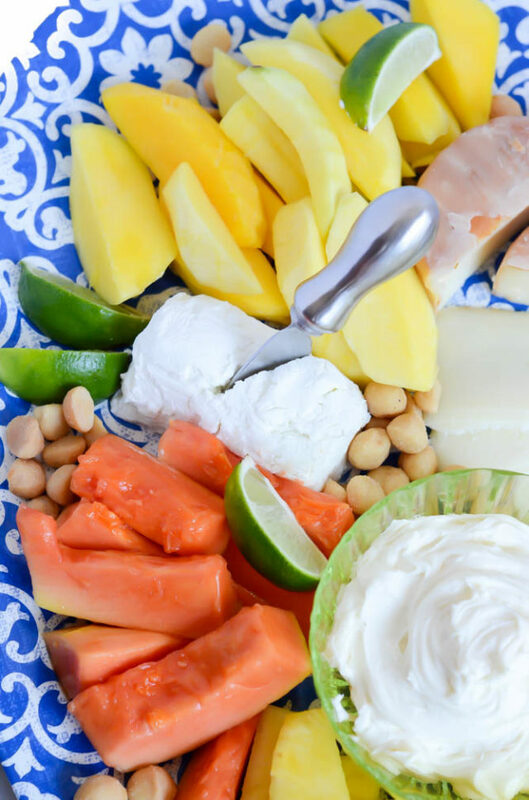 Now, as I mentioned, we’ve got Cinco de Mayo, Mother’s Day, Memorial Day and a whole summer of entertaining ahead of us, so start scoping out the best tropical fruit you can find and get to making this to-die-for Tropical Fruit and Cheese Platter! 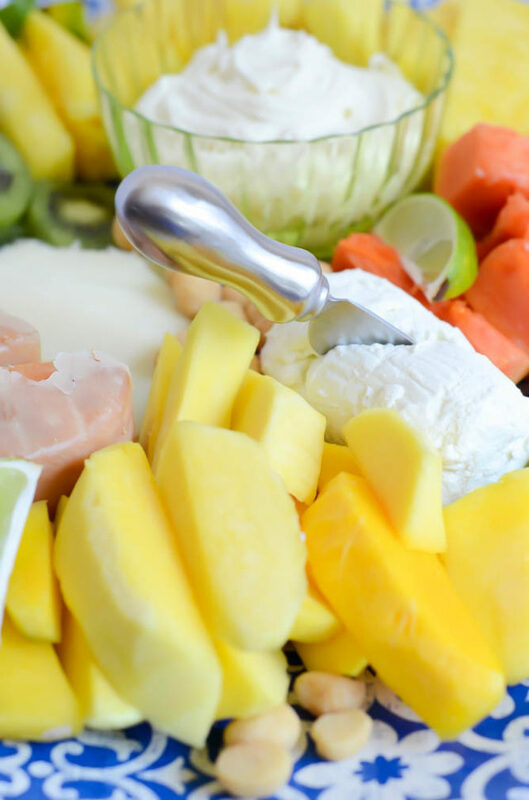 Tropical fruits are paired with a delicious selection of cheeses, honey and macadamia nuts - perfect for your next warm weather get-together! Make the honeyed mascarpone by combining the two ingredients in a small serving bowl. 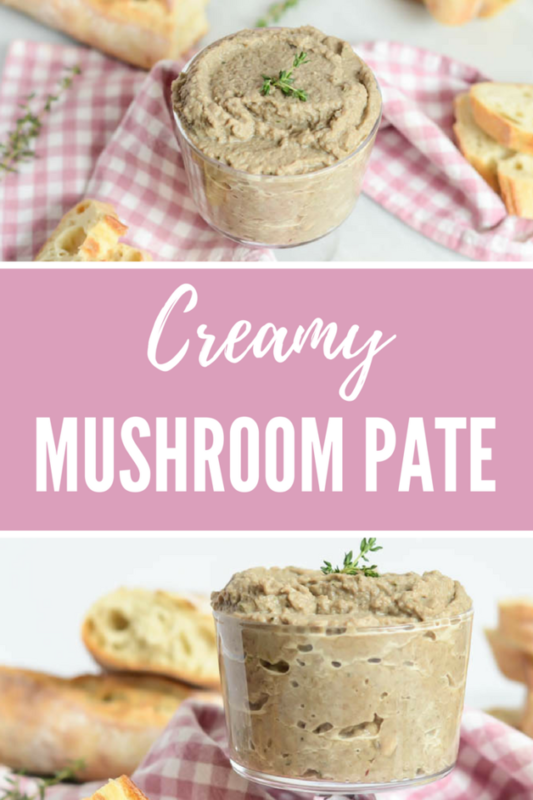 Arrange all ingredients on a large platter and serve! 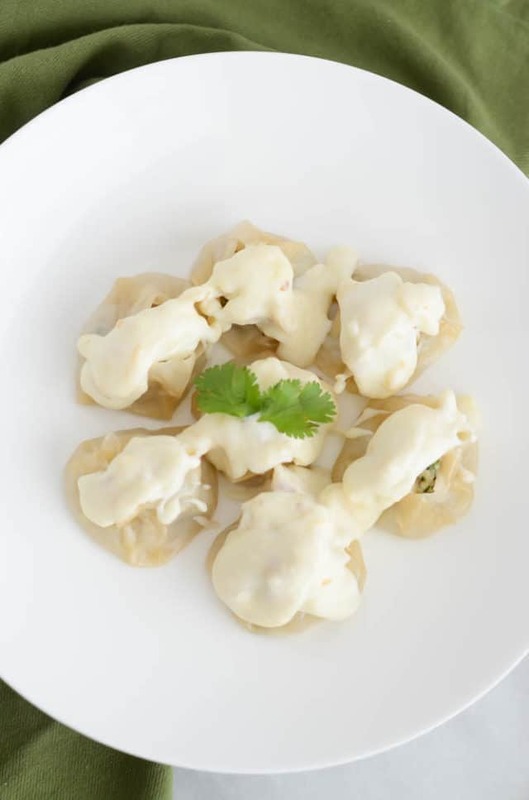 These little dumplings of deliciousness are chock full of pork, crab and fresh herbs, all topped with a savory bechamel studded with bonito flakes. This post was brought to you by all of the fab food I ate during my trip to Honolulu last month. One of my favorite things about traveling is going out to eat and getting inspiration from all of the delicious dishes I get to taste in the process. When I was younger, my dad would taste a dish at a restaurant and then, without even asking the server of chef exactly what ingredients were used, go home and recreate the dish perfectly. I like to think I got that skill from him? Well, whether or not I recreate a dish perfectly back at home, I still have a blast playing around with new flavor combinations that I’ve been inspired by. 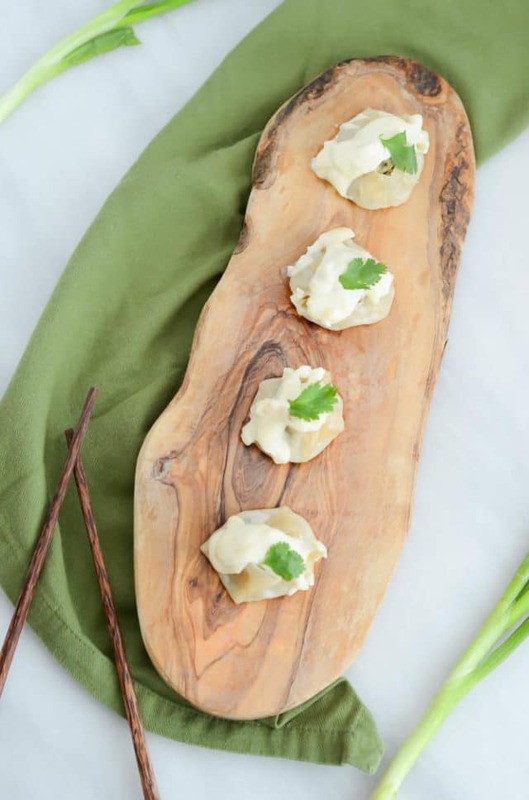 This Crab and Pork Shumai with Bonito Bechamel was inspired by the Lobster Shumai with Savory Crème Anglaise we had at Lucky Belly on the last night of our trip. I desperately wanted to use lobster in my shumai as well, but hey, this gal is on a budget and couldn’t bear spending $20 on a quarter pound of lobster meat. So crab meat it was, of course complimented by some ground pork to give the necessary heft to these shumai. For those of you who aren’t familiar with shumai, they are small, steamed Chinese dumplings, usually filled with a combination of ground pork, ginger, green onions, etc. They’re basically a potsicker, just shaped differently. If you’ve ever been to a dim sum restaurant, you’ve likely tasted these or at least seen them making the rounds on those little carts the servers roll around. 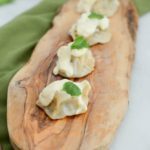 The whole process of making these Crab and Pork Shumai with Bonito Bechamel takes a little bit of time, but there’s nothing too difficult about it. 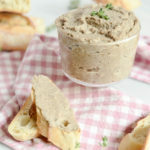 You’ll first want to make your crab and pork filling by simply pulsing all of the filling ingredients in a food processor. 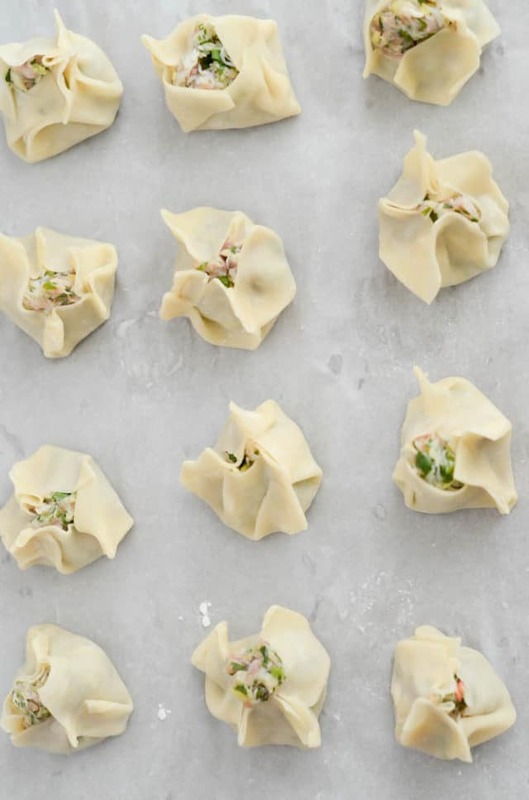 Then you simply lay out your square wonton wrappers (which you can also buy on Amazon if you don’t have an Asian market or Whole Foods near you) on a cookie sheet lined with parchment paper and start scooping the filling on to them. 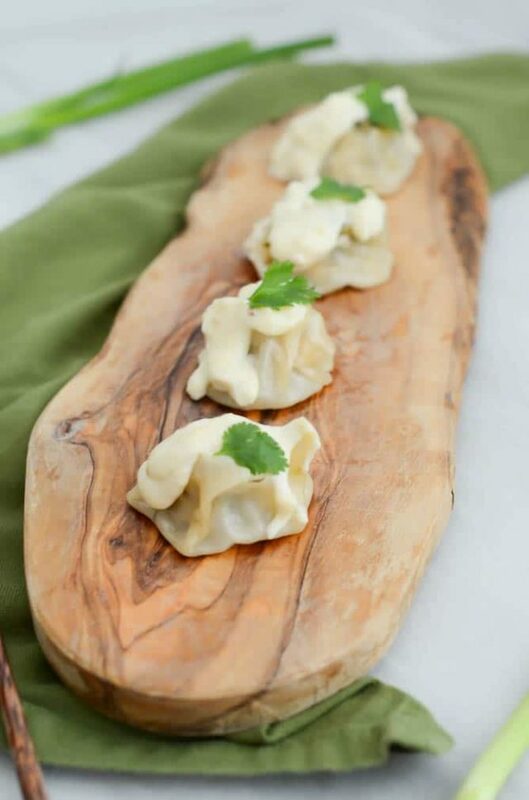 Dipping your fingers into a small bowl of water, you’ll then go through and pinch up the sides of each of the shumai, making them look a bit like a drawstring purse. Traditionally, you would use a bamboo steamer lined with cabbage leaves to cook the shumai, however I used a typical stovetop steamer that I just sprayed with some cooking spray. It worked beautifully! After a quick eight minutes in the steamer, your Crab and Pork Shumai are done! Then it’s time to make the béchamel. I used the classic Julia Child recipe as a base for my Bonito Bechamel, which is really quite easy (don’t be intimidated!) The sauce did turn out a tad thicker than I had imagined, but I hear that’s common just based on how you cook it. If your sauce thickens up too much, simply add a tablespoon or so more of milk until you have the desired consistency. 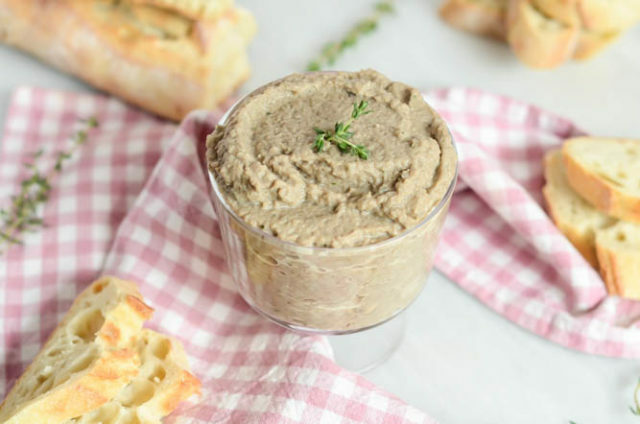 Aside from the basic béchamel ingredients, all you need to do to make this “Bonito Bechamel” is add in a tablespoon of the bonito flakes at the end. It seems simple but, trust me, it will pack a ton of flavor! And that’s it! Not too bad, right? And oh so delicious. The hubs absolutely went to town on these and I had to plead with him to leave me a few to have for lunch the next day. 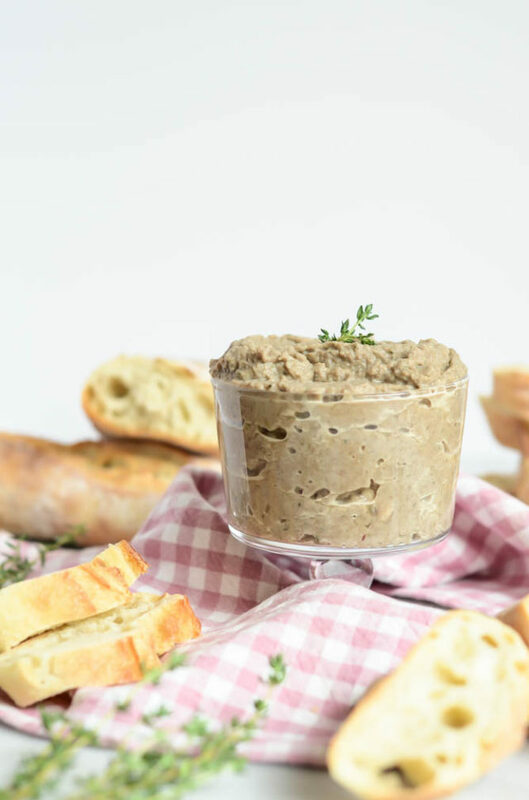 The savory pork and crab is balanced perfectly with the ginger, onions and other flavorings in the filling, and the Bonito Bechamel is the proverbial icing on the cake. In a food processor, combine pork, crabmeat, ginger, garlic, green onions, cilantro, sake, salt and pepper. Pulse until all ingredients are nicely combined. Cover a cookie sheet with parchment paper. 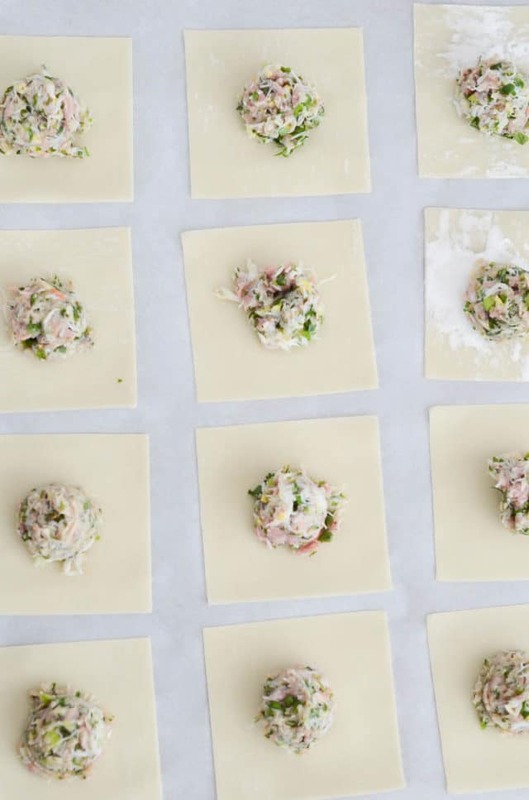 Lay wonton wrappers in rows on the prepared cookie sheet, then scoop about 1 teaspoon of the pork and crab mixture onto the middle of each wrapper. Place a steamer basket over a pan partially filled with water and spray with cooking spray (or line with cabbage leaves, if you have them.) 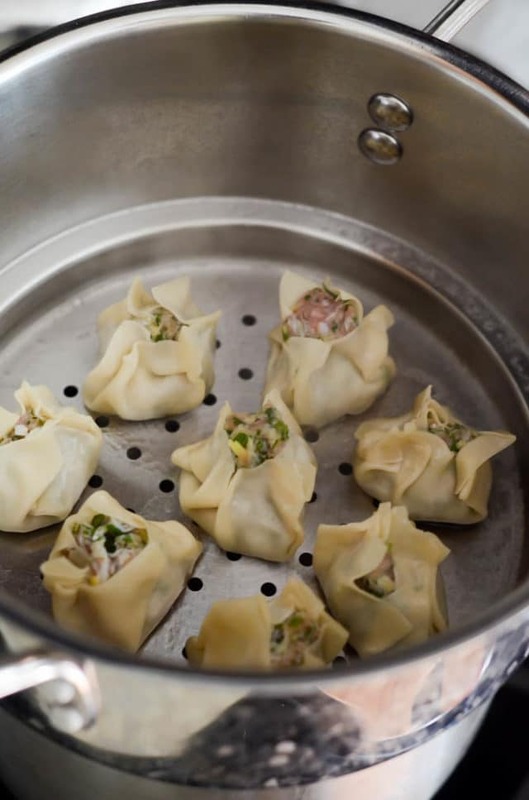 Heat up the water until gently boiling and then place shumai in steamer basket. You will need to steam the shumai in a few batches, they will not all fit at one time (plus, you want some breathing room so you can easily get them out without them coming apart.) Steam each batch of shumai for 8 minutes, or until the pork and crab mixture is cooked through. Remove from basket and begin cooking the next batch. 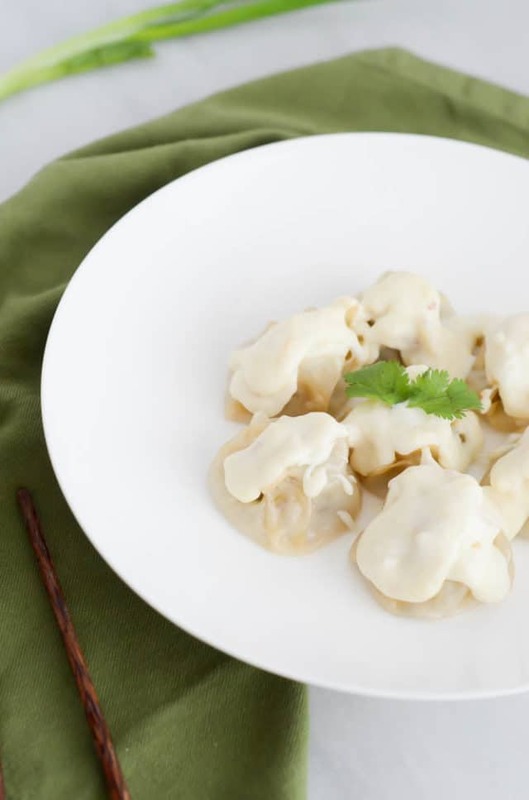 Once all shumai is cooked, place in a warm spot while you make the béchamel. You can also easily microwave the shumai for a bit once the sauce is ready if they get too cold. To begin making the béchamel, heat the milk and salt in a small saucepan until gently bubbling. In a medium saucepan, melt the butter, then add the flour. Whisk continuously for about 3 minutes to form a white roux. Remove from heat and, once the roux has stopped bubbling, add the hot milk mixture and immediately begin whisking vigorously. Set the saucepan back over medium high heat and, continuing to whisk, add in the lemon juice and bonito flakes. Continue whisking until mixture comes to a boil. Cook for one minute and then immediately spoon over the shumai. This post contains affiliate links. As always, all thoughts and opinions are my own. Thank you for continuing to support the brands that help make CaliGirl Cooking possible! It’s officially less than five months until I say I do! Annnndddddd…I picked up my wedding dress this weekend! It was somewhat surreal. You see, contrary to most brides, picking out my wedding dress was not a huge production. I literally went to the bridal salon with my mom, my sister-in-law, and my niece a few months after Chris and I got engaged, with the best intentions of simply trying on a few dresses and getting a feel for what I wanted. But then. Oh but then. I tried on the last dress and absolutely fell in love. I fell so in love that we had my dad drive down to meet us (I had promised him I wouldn’t buy a dress without his review and approval) and we ordered it on the spot that day. So, this was way back in August, and I have been waiting patiently for it (or sometimes not so patiently) ever since. And Saturday was the big day! The dress came into the shop, my sis drove down from Santa Cruz to meet me, and we made a day of it. Now, the moral of this story (aside from the fact that I am beyond excited that I now have my wedding dress in my possession) is that it gave me that extra kick in the booty to continue whipping myself into shape and eating clean, not so much to diet, but so that I feel amazing (both inside and out) on the big day. I seriously feel such a difference in my energy levels, my skin, and the way my body feels in general when I am feeding it whole, nutritious foods. Anyone else feel me on this? Side note –> I caved in and downloaded the Kayla Itsines app a little while ago and have now been doing the program for two weeks. I’m loving it! I’ve made sure to incorporate strength training into my workouts since forever, but in preparation for the wedding I wanted to mix things up a bit and give my body a little change of pace. I’m used to lifting heavier weights at a slower pace, but the Kayla Itsines app has you go through 28-minute high-intensity strength training circuits with mostly your body weight. It may just be wishful thinking but I feel like I’m seeing a difference already. I’ll be sure to keep you posted on how I feel once I’m a month (and two months, etc.) out! Has anyone else done Kayla’s BBG programs? Thoughts? Okay, back to eating clean, because that’s what today’s recipe is all about. 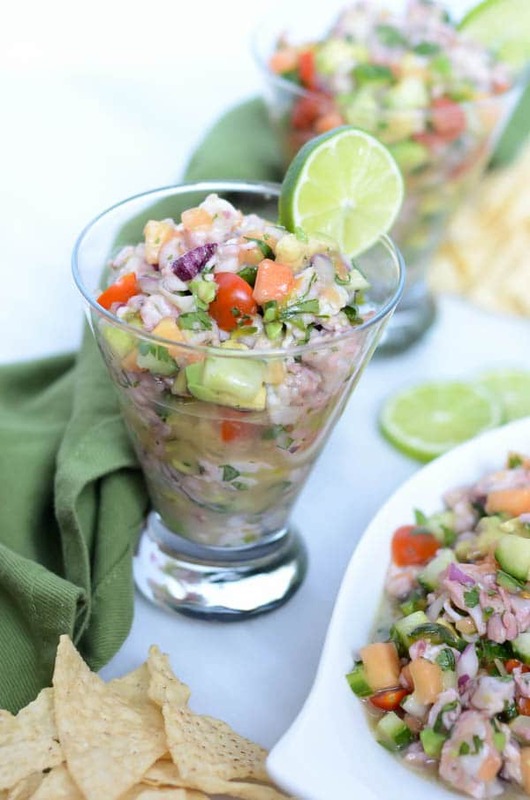 Ceviche is one of my absolute favorite “clean eating” recipes. It is so refreshing and light, yet full of flavor from things like citrus, jalapeno, cilantro, tomato, etc. 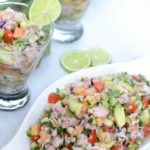 For this version, I decided to make a Shrimp Ceviche, and pump up the flavor (and nutritional benefits!) even more with the addition of some fresh papaya. Did you know that papaya is not only a great source of B & C vitamins, carotene and potassium, but it also does wonders for your digestion? I fell in love with papaya when I lived in Hawaii. Nothing like some sweet, juicy papaya with a squeeze of fresh lime juice after a long day in the sun! 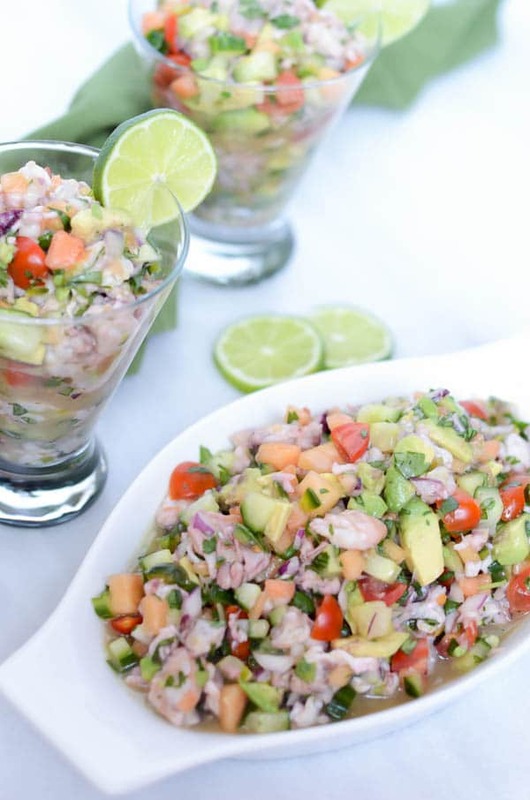 So it is what it is: Shrimp Ceviche with Papaya. 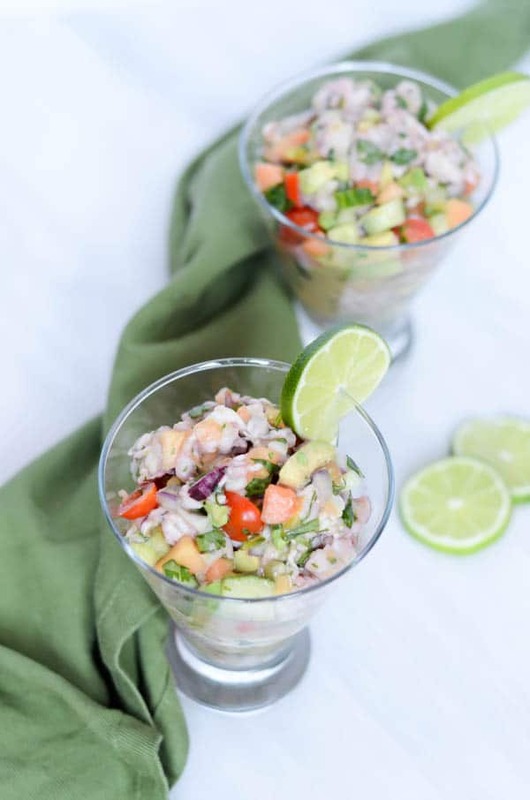 This dish is full of so many healthy, yummy foods (not just the papaya!) We throw in the typical lime juice, mix it up with some blood orange juice for a nice blend of citrus (regular oranges work fine if blood oranges don’t happen to be in season), and also throw in some avocado in addition to the typical jalapenos, cilantro and tomato (all so amazingly good for you!) This is truly a “nutritional powerhouse” of a meal. And it’s so tasty! Almost like you’re eating salsa but with some great protein and healthy fats thrown into the mix. The only (semi-scary) part is getting the raw shrimp “cooked through” with the lime juice. Trust me, I was worried about this too! But I included plenty of acid (from the lime and blood orange juices) in this recipe so you truly do not have to worry about it. Just let the mixture sit a little bit longer than the recommended 30 minutes before eating if you’re not sure. You just want to be sure that the shrimp has taken on a pinkish hue and is turning opaque. The dish really does get better the longer the flavors meld together! 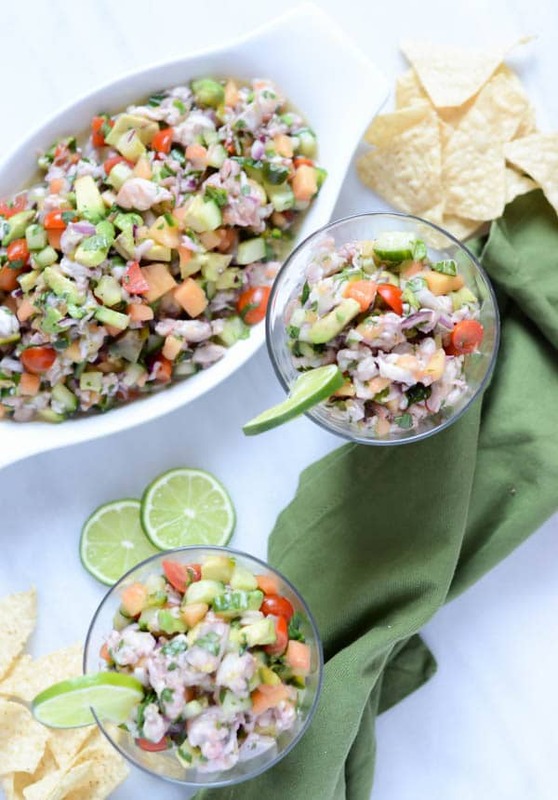 I think Shrimp Ceviche with Papaya is going to be my go-to weeknight dinner, cocktail party or weekend barbecue contribution for the foreseeable future. Waistline friendly and super tasty! Now how can we beat that? 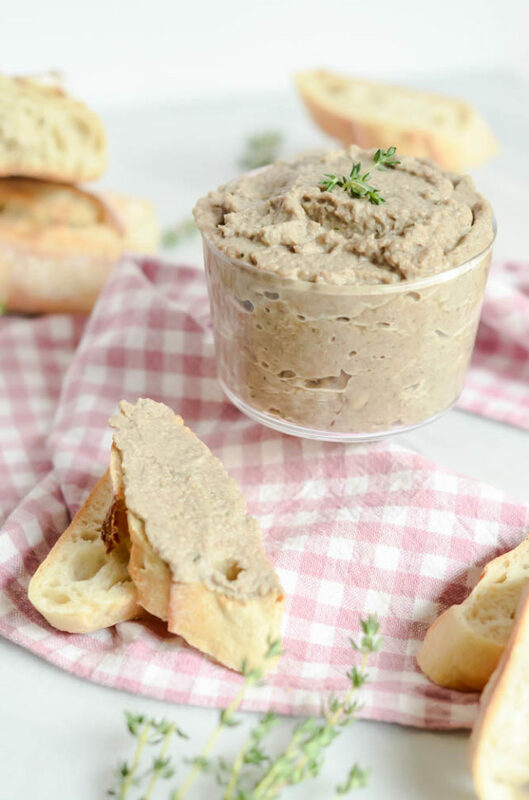 And for more clean eating inspiration, be sure to check out these other healthy recipes! 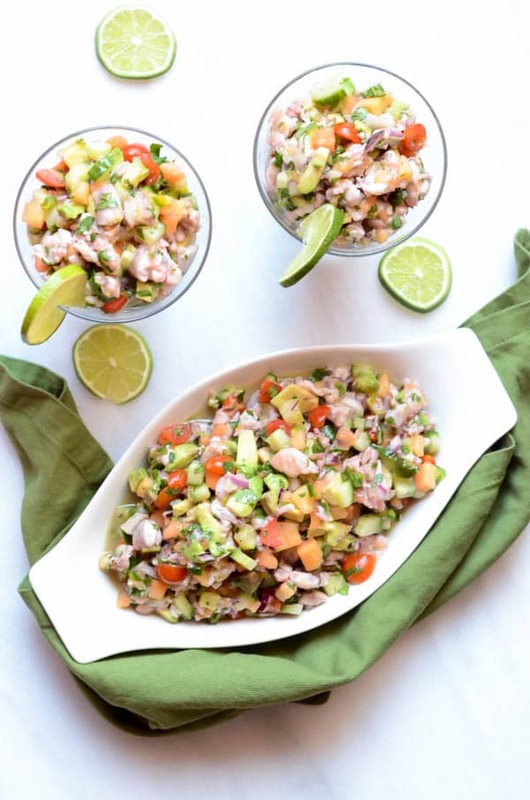 A refreshing, tasty and healthy shrimp ceviche with an extra dose of nutritiousness from fresh papaya. Remove tails from shrimp and cut into a small dice. Add to a large non-reactive (i.e. glass or metal) bowl with lime and blood orange juices. Add papaya, cucumber, red onion, jalapeno and tomato. Cover bowl with saran wrap and place in refrigerator for at least a half hour, or until shrimp has turned slightly pink and opaque. Wine Pairing Suggestion: Depending on the level of sweetness you like in a wine, I’d highly recommend a light, grassy Sauvignon Blanc such as this (for dry wine lovers) or a slightly off-dry Riesling such as this (for sweeter wine lovers.) 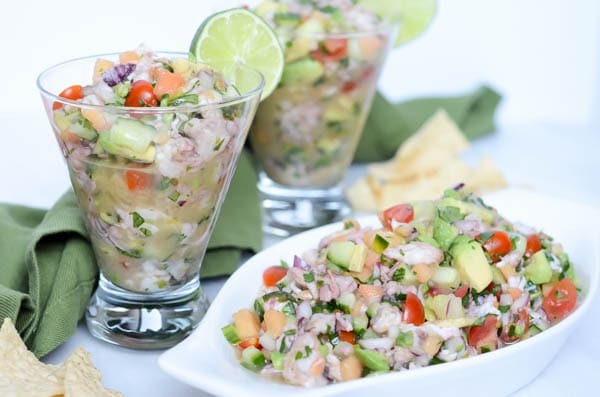 The grassy, herbaceousness of the Sauvignon Blanc will pair nicely with all of the fresh flavors in the ceviche, while sweet, nectar-quality of the Riesling will help counteract any heat from the jalapeno.